Congratulations on the new airline coming to our lovely Jewel! 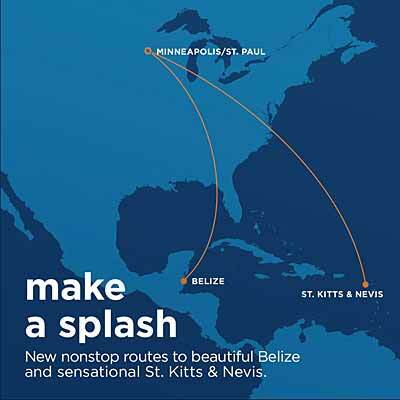 We are excited to welcome Sun Country Airlines' new non-stop flights from Minneapolis to Belize. The services begin on Saturday December 22, 2018, so those looking for a tropical holiday vacation now have one more option available to paradise! For more information, visit https://SunCountry.com. The Belize Tourism Board is celebrating a new partnership with Sun Country Airlines, which today announced the first-ever seasonal nonstop service from Minneapolis/St. Paul to Belize, marking the 10th U.S. city to offer nonstop service to the Central American nation. Sun Country will operate roundtrip flights once weekly on Saturdays between Minneapolis/St. Paul (MSP) and Philip S. W. Goldson International Airport in Belize City (BZE). Service will be offered from December 22, 2018 to April 20, 2018. Check suncountry.com for full flight schedule, including departure and arrival times. Minneapolis/St. Paul joins an ever-expanding list of U.S. and Canadian markets offering nonstop flight service to Belize. The list currently includes Los Angeles, Chicago, Miami, Denver, Newark, Charlotte, Atlanta, Dallas/Ft. Worth, Houston, Calgary and Toronto.